changed with the time shift. Step into the fastest elevator in Europe to begin your journey through the eventful history of one of the world&apos;s most significant and popular squares. In just 20 seconds you will be whisked up to the 24th floor, where you can enjoy breathtaking views of Berlin. No other place offers such spectacular views of the city’s most famous landmarks and historic sites! The Brandenburg Gate, the Victory Column and Bellevue Palace are all just a stone’s throw away. The open-air exhibition “Views of Berlin” will show you how this historic site has been completely transformed again and again: from a quiet green to the pulsing heart of a major city, from the height of luxury to a field of rubble, from a no man’s land to the new centre of Berlin. An experience for all the senses – and the same goes for our PANORAMACAFÉ on the 24th floor and spectacular roof terrace on the 25th floor! Treat yourself to the best sundowner in the city! The destination above the rooftops of Berlin. "VIEWS OF BERLIN at Potsdamer Platz"
The Potsdamer Platz is one of the squares in Berlin, which in the course of time have been repeatedly the scene of the history. The development of the place was often a reflection of Berlin and the German past. The Exhibition “VIEWS OF BERLIN at Potsdamer Platz” takes you on a journey through the Berlin of the past centuries. Now the catalogue of the exhibition with all the exhibition content and exciting additional information is available. 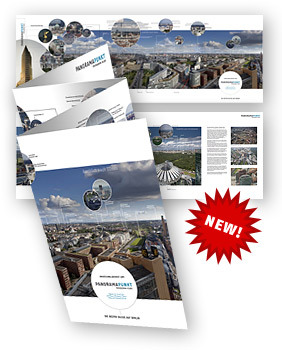 For just €12,50 you can purchase one exemplar of the high-quality printed catalog at the cash desk of PANORAMAPUNKT. If you would like to purchase a catalogue, you can order it directly here with stating your name and address (plus € 1,45 postage/within Germany). In 2019 PANORAMAPUNKT at Potsdamer Platz will be included in the Berlin Welcome Card again. That means tourists with the card will pay only € 7.00 instead of € 10.50 for a visit to PANORAMAPUNKT including a 360-degrees PANORAMIC-Map! What is the Berlin Welcome Card? This ticket gives visitors to Berlin unlimited use of all public transportation plus discounts of up to 50% on 190 attractions. You can find more information at www.berlin-welcomecard.de. 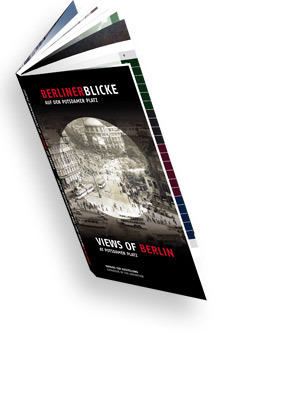 Do you want to take the best views of Berlin home with you? Our 360-degree PANORAMIC postcard is available for just €3.00 at the PANORAMAPUNKT ticket desk and at our café on the 24th floor. Take home a great memento of your visit to PANORAMAPUNKT!